"Lives in limbo" Children at the Tender Loving Care orphanage roam the dark corridors of the home, two years after scandal brought the closure of almost all privately run orphanages in Andrah Pradesh. International adoptions are now illegal in the state and most of the children at TLC have been caught in the middle. Many of the children had already been cleared for overseas adoption and had even met their prospective parents. Their fates remain uncertain even two years later. 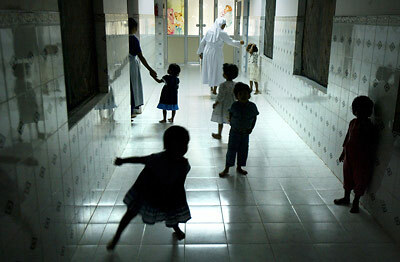 In the background, Sister Teresa, tends to one of the children.